In this third week of Villains Month quite a few big names get their spotlight in individual issues: Lex Luthor, Black Hand, Ra’s al Ghul, Penguin, and the new kid on the block whose made his meteoric mark across all four Super-titles, H’el. This should be good. 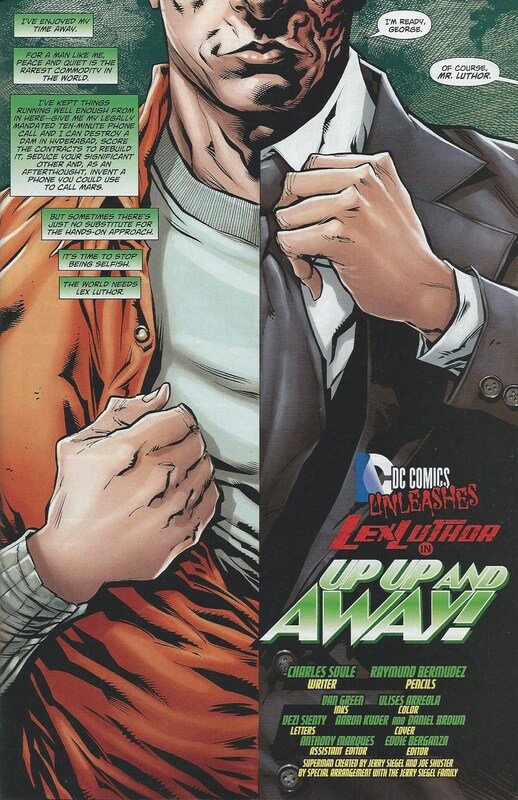 Action Comics #23.3: Lex Luthor presents a very comprehensive vision of Lex Luthor, depicting events between his emancipation from the Hypermax Prison (which he himself designed for himself) and the opening moment of Forever Evil #1. The issue begins with a very iconic image that sets a comparison between Lex and his arch-rival, Superman. It is split down the middle with the left half bearing Lex ripping open his orange prison jumpsuit to reveal a white undershirt and the right showing him donning his pristine business suit. Whereas the imagery borrowed from Superman has him ripping open his suit to show his heroic costume and nature, or straightening his tie to hide his identity and resume anonymity, Lex’s duality portrays the exact opposite. Ripping off his prison oranges he is prematurely exiting his punitive captivity through backroom dealing and corruption showing the ignominy of his nature, and putting on his suit he prepares to enter the limelight, not stray from it. The issue then continues to show his paranoid narcissism, malice, and lack of humility Luthor’s first thought when he is clear of the prison is, “Where is Superman?” The point being, “Why isn’t the Man of Steel here to see me leave the prison? Obviously I am the most important thing in his life, so why isn’t he here?” From there Luthor goes about ruining a fellow businessman’s life for sport and animalistic territoriality, while also staging an elaborate test to draw out the Man of Steel, if in fact he is still on Earth or close enough to take notice of the goings on that Luthor has set into action. He has the best plastic surgeons on the planet remove the massive scars Superman burned into the left half of his face when he put Luthor into Hypermax. And then when the massive calamity he engineered reaches its apogee, he stands at a crossroad of action: Step in and save the day, stealing Superman’s thunder or hold back and let events unfold leaving Superman to blame for not intervening. Both are appealing choices for Luthor, but his choice and the inevitable monologue that comes with it in explanation underscore just how cunning and brilliant he is, and how multi-tiered his machinations are when all elements are stacked one atop the other. Charles Soule writes the character keenly with all the guile and artifice requisite for this pillar of DC canon, balancing the many aspects we’ve come to expect from the greatest criminal mind on the planet. Ray Bermudez provides art on the issue, and even if everything else is thrown out, his renderings of Lex make the issue soar. Throughout the issue Luthor exhibits many different emotions: disgust, condescension, anger, frustration, smug success, thoughtful introspection. Bermudez depicts each on the bald headed megalomaniac with masterful skill. How this rendition of Lex will figure into Forever Evil, we will just have to see, but it’s truly something exciting to ponder. You’ll Believe a Man Can Walk . . .
Green Lantern #23.3: Black Hand is the second issue penned by Charles Soule that came out this week and the less impressive of his works, unfortunately. His writing of it is good, but the material given him was a little sparse. Black Hand figured prominently into Blackest Night, of course, and from there he played his part in the “Secret Origin of the Indigo Tribe”, and later the “Wrath of the First Lantern” where he seemingly was locked away in the Dead Zone. However, as the issue begins his black ring makes it to Earth, deus ex machina, falling into the ash piles behind his families’ mortuary where the unclaimed bodies of the crematorium are dumped. Through this is he able to regain a body, but not memory. Slowly as he walks the Earth and feeds upon death he regains his mind and his power. Once his memories reassert themselves, so too do his old enmities leading him to a revenge he has sought for some time, but never had the chance to enact. That revenge come with the visiting of a very special grave and the resurrection and desecration of a body that is sacrosanct to his greatest foe. There are good ideas written about in this issue, but the presentation of them is drawn through a drawn out plot that is filled in which cheap zombie theatrics that play off the Walking Dead hysteria. What I loved about Blackest Night was that it didn’t play to cheap zombie fetishes as Marvel Zombie was wont to do. The undead were utilized in thoughtful, provocative ways that were chilling and manipulative to those whose loved ones were brought back. This issue was just cheap, unintelligible masses of reanimated corpses mindlessly causing havoc. Granted this is a single 24 page issue so there wasn’t a lot that Soule could do, but I also feel like his hands were tied by restrictions from doing something worthwhile placed upon him by editorial, as it may have stepped on Geoff Johns’ toes. Merely a theory. I will say that the use of dead bacteria in a policeman who was recently vaccinated to kill said officer was quite interesting. Considering the massive undead quotient in this issue, the use of former Frankenstein: Agent of S.H.A.D.E. artist Alberto Ponticelli was quite apt. His depictions of both black hand and the ambling dead are ghastly, really setting the morbid mood. Superman #23.3: H’el is the much awaited follow up to Scott Lobdell’s “H’el on Earth” storyline in which the eponymous villain attempts to save his destroyed planet of Krypton by converting all matter in our solar system (including Earth) into energy to power a chronal incursion into the past so that himself, Superman, and Supergirl could prevent the sequence of events leading to Krypton’s doom. His plan is thwarted, and yet somehow at the end of the final issue of that arc, H’el is transported back to Krypton around the time he wished. In this issue, writer Scott Lobdell picks up right where he left off with the help of artist (and Lobdell’s authorial predecessor on the Superman title) Dan Jurgens. H’el is in a coma and with no name, severe scarring and mutilation throughout his body from the rigors of untested space travel, and a giant shard of kryptonite in his chest that would kill the average Kryptonian, he proves to be quite the scientific enigma. Such a riddle calls for the appropriate mind, and Krypton’s answer is the young, up-and-coming Jor-El. Like Sherlock Holmes, Jor-El is able to deduce almost everything there is to know about H’el from his condition, including that he is Kryptonian, had recently been in outer space despite the fact that no spaceship or wreckage was found anywhere on Krypton, and that he also had to have come from the future. His cunning in deducing the improbably with such clarity of mind is mind-boggling. H’el, though unconscious, is aware of what is going on via astral projection of his psyche in an externalized form, owing to heightened mental capacities endowed by the previous events from “H’el on Earth.” It is through this that he is granted the TRUE revelation as to his origin, his history, and the lie that led him on his genocidal bid to resurrect his race at the cost of the human race and any others existing in our solar system. He even comes to learn the meaning of his name, “H’el.” This issue is so visceral if the reader took the whole journey of “H’el on Earth” and saw the man H’el was throughout that series. His passion and his goal of resurrecting Krypton came from a wellspring of love for his people that completely cut his psyche off from acknowledging any other lifeforms’ significance in the universe in comparison. Now we see a complete diametric flip. Like flipping a light switch that turns light to utter darkness and vice-verse, we see the flipping of a switch with H’el following his apocalyptic moment of remembrance transforming him from savior into destroyer. All this leads directly to October’s Action Comics Annual #2. Lobdell hits this one out of the park. 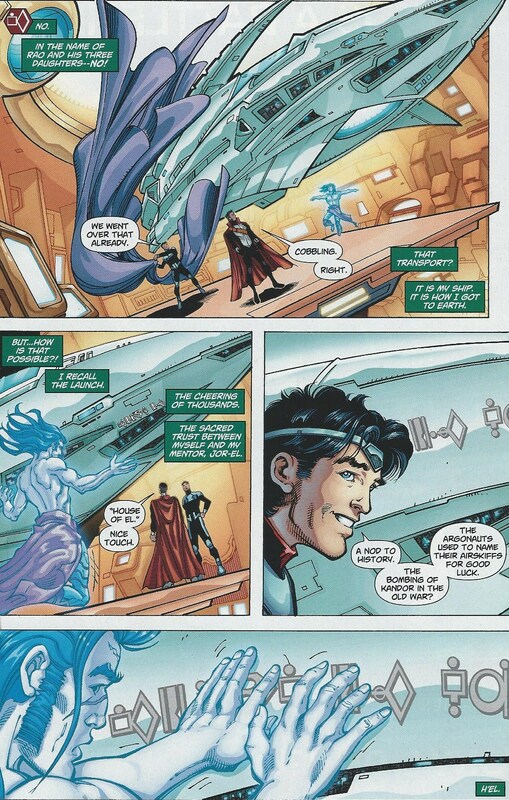 He has become the quintessential architect of the New 52 Krypton and this issue is a keystone in that foundation. Swamp Thing #23.1: Arcane presents the third and last of Charles Soule’s issues to come out this week. This time he takes on the villainous lord of the Rot who was last seen in Scott Snyder’s final issue of Swamp Thing, after which Soule took control of the title. Though Snyder put him into exile and Soule left him there in the three issues of Swamp Thing he has written so far, now he is granted the chance to look back and work his magic on Arcane himself and Arcane’s lovely yet deadly (pun intended) niece, Abigail. Firstly, Soule depicts masterfully the kind of purgatory that would most amply punish a man like Anton Arcane, former avatar of the Black. A man who thrives on death and decay is consigned to forever green fields with flowers, trees, babbling brooks, and small adorable creatures such as rabbits poking about. No matter what he tries, nothing dies and nothing decays. Life never stops. Even his own self mutilations do not last. When Abby, bearing the mantle and powers of avatar of the Rot, comes to him in glory she asks that he tell her about what happened to her mother. In his story we learn the origin of his birth, the advent of his connection to the forced of death and decay, and how he came to defile through perverse affection the body of Ilse Arcane. However, despite the profanity of his deeds, there is a dark twist to the true end of Abigail’s mother. Soule may not have written or engineered the current iteration of Arcane or Abigail, but he writes them both as though he had. Jesus Saiz provides art on this issue providing soft beautiful lines when necessary and terrifying horrors the rest. Batman & Robin #23.3: Ra’s al Ghul and the League of Assassins is another Villains Month issue written by James Tynion IV and drawn by Jeremy Haun, whose art was last seen in the Batman: Riddler issue one week ago. This issue differs from the Court of Owls issue in that the story presented of Ra’s al Ghul seems to be more of a means to an end than an actual story. It begins during the Fifth Crusade with a Teutonic prince entering a dark tower in the east to ferret out the fabled demon that lived within. Cut to the present another outsider, this one an unnamed representative of the Secret Society, comes to the dark tower with an offer of membership to join the Society and have a part in the reshaping of the world that is to come. Ra’s won’t even consider it until this Society lackey tells him more about why this is something that he would do. The narrative then goes through several stages of recounting his history and making a hodgepodge of versions from the past come together in a single back-story that will be his “official” history going forward. The origin as a vengeful husband and physician to a corrupt sultan as presented by Ra’s creator, Dennis O’Neil, is maintained. Next they factor in Ra’s involvement with the All-Caste and the Well of Sins, as written in Red Hood and the Outlaws by Scott Lobdell. Next Tynion sets the up a string of events throughout history that establish Ra’s as an architect of history through the engineering of calamities. Like in the film Batman Begins they have him being responsible for the Great Fire of London, as well as addicting the Chinese people to opium in the 1700’s, creating the cholera epidemic in New York in 1832, and orchestrating the assassination of Archduke Ferdinand. The final touch is bring in Talia’s failed Leviathan rebellion against her father for leadership of the League from Grant Morrison’s Batman Incorporated title, establishing the last major event to occur in recent days. With that out of the way, Tynion has the freedom to do with the character as he likes with all or most of the questions of who Ra’s al Ghul is answered. This issue has a lot of similarities with Tynion’s Court of Owls piece, delving heavily in flashback and anecdotal explanations of megalomania, but unlike it the Ra’s al Ghul issue feels very mechanical. The Court of Owls, while just as far reaching as Ra’s in the comics’ reality, is relatively young from the reader’s perspective, less than three years to Ra’s thirty years in comics, so while Tynion and Court creator Scott Snyder are still making things up as they go, Ra’s’s history is being cut and cobbled together from several different time periods from several disparate creative voices. The Court felt very smooth and homogeneous, because there are no preconceived notions surrounding that organization, owing to its fledgling nature, and contrarily the Ra’s al Ghul story suffers from many preconceived notions and the feeling that there is a great deal of shoehorning material into a small space to make a presentation that honors varying concepts from his past presentations. While interesting, it’s far from my favorite Villains Month issue. Justice League Dark #23.3: Eclipso resurrects the evil shadow demon, reworking him in a similar manner to most of the better characters and concepts in the New 52. His entrance to the New DCU was very erratic, coming piecemeal in several disparate titles such as All-Star Western, Team 7, Demon Knights, Catwoman, and Sword of Sorcery. The lattermost title had Eclipso’s origin not dwelling in the Judeo-Christian inspired role of God’s first angel of vengeance, but rather as the unholy offspring of Houses Diamond and Onyx of Gemworld. There his name was Lord Kaala. When he returns to the place of his birth from his exile in our world, he does so in the body of Alex Montez, his second host in DC canon. This issue opens with Eclipso infiltrating the life of his primary host . . . sort of. Originally Eclipso was bonded to Bruce Gordon, a scientist specializing in solar energy. This time around writer Dan Didio maintains the character of the first host, while changing his name to Gordon Jacobs. Purportedly, Bruce Gordon’s name came from a mash-up of Bruce Wayne and Commissioner Gordon. The name is definitely a worthy change. Whereas before Gordon was infected by a shaman on a remote South Pacific island wielding the black diamond, this time around he is a disgraced energy prodigy whose failed “Solar City” experiment cost him his reputation, his sanity, and the woman he loved. This led to his obsession with finding the fabled black diamond whose properties he hypothesizes might aid in his research. What it ends up doing is opening a dangerous door into unfathomable darkness. Bruce Gordon was a decent man whose possession by Eclipso was a horrible accident. Gordon Jacobs’ on the other hand was both premeditated and of his own choosing. Through embarked upon by paying heed to honeyed words from an infernal entity’s lips, he is still the one who inflicted the wounds with the black diamond that set Eclipso free. Whereas Bruce Gordon was an unfortunate innocent cursed by chance, Gordon Jacobs condemned himself in a devil’s pact. Didio teams up with Philip Tan again, after the two worked on Phantom Stranger together several months ago. Didio’s writing and Tan’s artwork combine to create very eerie storytelling that is worth looking into, especially considering the transient nature of this enigmatic villain who slips into titles where seemingly he has no place. Yet there he is in 19th century Gotham, medieval Europe, an other dimensional gem world, Gotham of the 21st century, Hell, a prison in the middle of the ocean. You never know when or where he will next appear, so it’s best to know thine enemy. Justice League #23.3: Dial E is the biggest enigma of Villains Month. I admit to not having read the final eight issues of the series, but even still the plot of this special issue was all over the place and hard to pin down. The main character of the first thirteen issues, Nelson Jent, was completely absent in the story. The other operator he met halfway through the first arc of the title, Manteu, also is absent. The villains they encountered are absent. There is a group of four teenaged kids, two girls and two boys, who get their hands on a dial. The blonde girl, Gwen, who stole the dial, spins it and becomes a villainess called “Suffer Kate” with the power to make those around her choke for breath. The issue then unspools with the kids alternately turning into various versions of various schizophrenic conceptual characters. 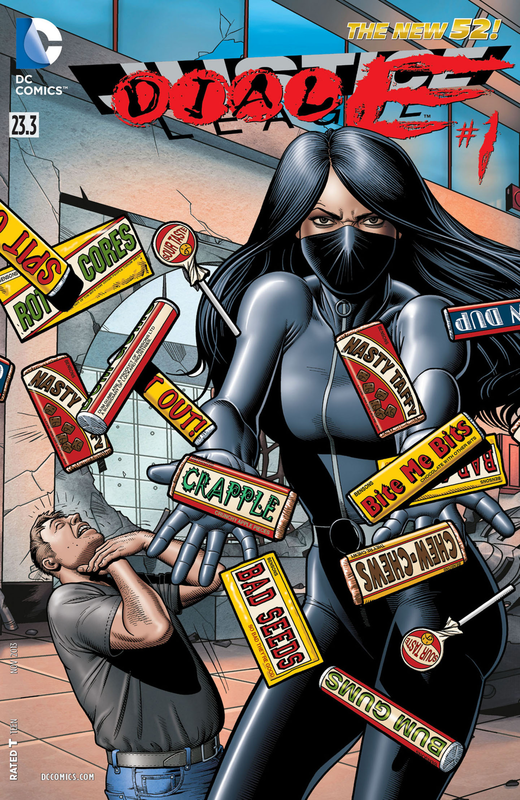 Ironically, the only concept they didn’t use was the strange masked villainess that Brian Bolland drew on the corner throwing candy bars. Nelson is also depicted on the cover, though not in the story. The biggest draw to this issue is that every single page is done by a different artist, none of whom bear any stylistic resemblance to the others. These artists include the likes of Matteus Santolouco, Jock, Jeff Lemire, Frazier Irving, Alberto Ponticello, and Dan Green. It’s fun to look at, but not much fun to read unless you crave a heavy dose of insanity. Batman #23.3: Penguin is a pretty straightforward Penguin story. The Penguin is the ultimate abused psyche that climbed to power and influence with intelligence and hard work. In this way he is admirable and someone worth emulating. 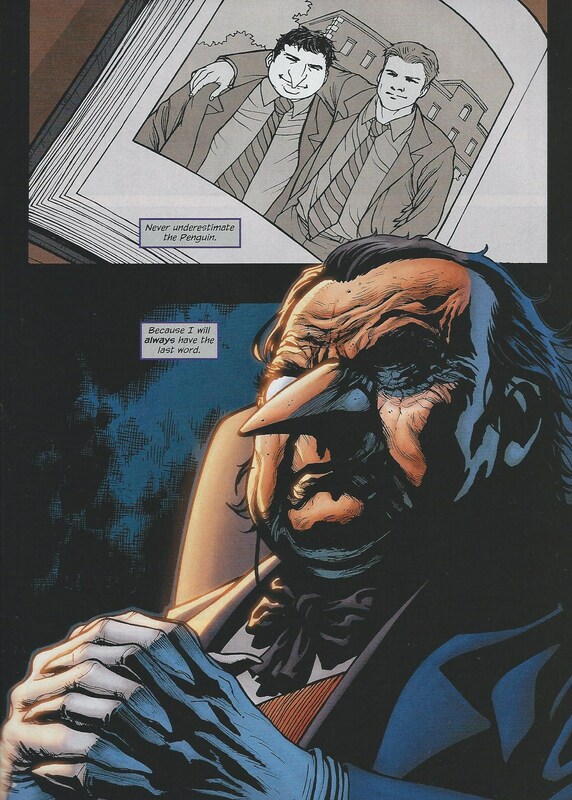 However, this issue also underscores the opposite and what Oswald Cobblepot lost on his way up to the top. Penguin was always a man to be feared, but following the events of the “Emperor Penguin” storyline in Detective Comics that reputation has plummeted to next to nothing. The issue opens up with that misconception illustrated very colorfully, that the Penguin is weak after his cockfight with his former protege, Oglivy. This misconception proves to be fatal for those that thought it and the consequences bolstering his image as someone not to be trifled with. It also draws attention of the wrong sort upon him by the governor himself who plans dramatic changes for Gotham to cut crime and make the city more wholesome. Clearly this would cut into the Penguin’s pocket and cause him issues. However, the twist comes in Penguin’s relationship to the governor, Carter Winston. At school due to his freakish appearance, Oswald was bullied ruthlessly. Handsome, rich, popular Carter was the only one who stood up for him without really having a reason to. So the stage is set to see how these old school chums will sort out their affairs, what power and influence mean to those that have it and those that don’t, and what a reversal of fortune can mean to both. Frank Tieri writes a very Machiavellian plot that really explores these very harsh principles that unfortunately govern human society, no matter the age. Christian Duce provides art and like Bermudez’s work on this week’s Lex Luthor, Duce’s rendering of Penguin is all that matters in the issue. Cut the rest out and his Penguin drawings will be worth the cover price. The sinister, angular, sophisticated savagery that he imbues into the Gotham crime boss are stunning. This issue was pretty darn good, and Penguin doesn’t even make my top ten list of Batman villains. That says something. Detective Comics #23.3: Scarecrow is a pretty round about issue that doesn’t really talk about the Scarecrow as a character, but more facilitated the coming limited series Forever Evil: Arkham War. Before this, Scarecrow had been depicted as Secret Society stooge running around evangelizing DC villains left and right to the cause of the Crime Syndicate. This issue has Scarecrow running around, this time organizing the demarcation of Gotham into spheres of influence among the big names of Arkham: Mr. Freeze, Riddler, Poison Ivy, and seemingly Croc. In this way the issue is interesting in its scope, but not in its relevance to Scarecrow. It does bear mentioning that Gregg Hurwitz’s origin of Scarecrow in his first arc on Batman: The Dark Knight could hardly be improved any, so the lack of elaboration here isn’t surprising. Peter Tomasi writes the actual issue pretty well, despite it’s unorthodox story structure. Artist Szymon Kudranksi provides the eerie art to coincide with the haunting subject. Batman: The Dark Knight #23.3: Clayface was one of the worst issues I have read in some time. Clayface is a character I don’t care about. Occasionally he is done well, as in the Batman: The Animated Series cartoon or in the few instances that Scott Snyder has used him. Gregg Hurwitz’s usage has only been so-so in the current run of Batman: The Dark Knight. Despite not liking the character, I bought this issue with those past examples in mind and because John Layman, whose run on Detective Comics I feel is one of the best ever, was writing it. Bad idea. The whole premise of the comic is Clayface is a loser that won’t amount to anything. He was a loser as an actor and so he became Clayface (which Layman didn’t even provide a back-story on) only to continually get shortchanged, make dumb decisions that cheated him out of his paydays. When the Secret Society shows up he waits for his call and it doesn’t com, seemingly because he’s a loser and not worth their time. He attempts to do something to get their attention, only to get in their way and mess up an operation they were running under the radar, prompting him to be back in a bar with his proverbial tail between his legs. Then he gets wind of a job and signs on for what inevitably will be another SNAFU from his inept personality. Perhaps this is a pessimistic view and the moral is that no matter how rotten he messes up, he picks himself back up and tries again. That’s a sunny outlook, but one that is predicated off the understanding of learning from one’s mistakes. Clayface is depicted time and again doing the exact same things and falling into the exact same traps. This precludes the “pick yourself up and try again” proverb and points to the “stupidity is doing the exact same thing and expecting a different outcome” adage. This in no way dents my faith in John Layman as a writer, but it does unfortunately hurt my idea of Clayface as a character. 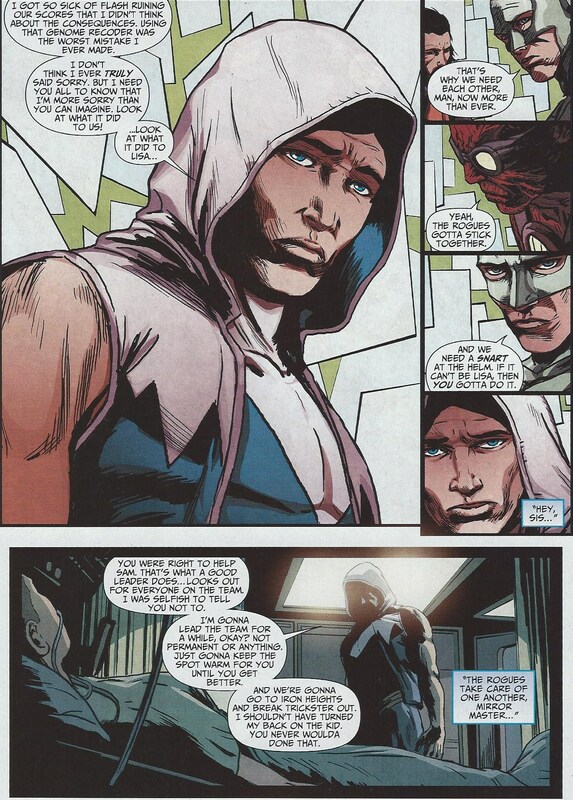 The Flash #23.3: The Rogues ranks up there among the issues put out during Villains Month that NEEDED to be told. The Rogues are a cornerstone of the Flash title that holds the concept up and comprises a inextricable part of the overall mythos. Separately Captain Cold, Mirror Master, Heatwave, Weather Wizard, Golden Glider, and the Trickster are decent characters, but together they combine to create a whole larger than the sum of its parts. Together the Rogues form a sort of family that behaves much like any family does, acrimoniously sometimes, but often with love and respect for one another. Since just before the Gorilla War was incited by Grodd, Lisa Snart (a.k.a Golden Glider) had taken over leading the Rogues from her older brother, Leonard Snart (a.k.a Captain Cold). Cold wasn’t so keen on the idea, but the Rogues voted and so it was. The issue opens with Lisa leading the Rogues on a bank heist into a vault through subterranean tunneling after hours. The job is aborted when the structures of surround buildings, both occupied at the time, are nearly compromised and the lives of those people are jeopardized. It wasn’t a popular move, but the Rogues don’t kill innocent people. It’s part of the code they live by. Afterward, the strain of their situation catches up with them. Jobs tend to keep the Rogues focused on forward motion, but during periods of lag the ghosts of their past catch up with them, namely the nature of their powers. One of the interesting things co-writers Francis Manapul and Brian Buccellato did when they took over the Flash is convert the gadget equipped Rogues to super-powered villains, internalizing their abilities inside them, with no external sources, i.e. Cold’s freeze guns, or Heatwave’s flamethrowers, Weather Wizard’s weather wand, etc. Their bodies now generate their respective powers autonomously. When Captain Cold initiated this through the use of a device called a “genome recoder” he unleashed nightmarish results on his teammates in varying degrees. Heatwave is a walking burn victim, scarred from stem to stern, Mirror Master is trapped perpetually in his Mirror World, and worst of all Lisa is in a coma that she can’t be awoken from and is only able to exist as the Golden Glider by astral projection. It is because of this that Cold isn’t as well liked at the moment by the other Rogues and why he maintains the icy disposition that he does. Taking responsibility for ruining your family’s lives is a hard pill to swallow. Writer Brian Buccellato does a masterful job of really making you feel the pain of each Rogue in accepting their fate and the consequences that lie in trying to change that fate. As stated before, the Rogues have a code they live by, so though they are villains and aptly deserve their place among the panoply of DC baddies that are getting their own issues this month, the Rogues are far from evil and it is that anti-heroic nature that sets them apart from most of their fellows. At issue’s conclusion, the family of Rogues, after a healthy, cathartic shouting match come together as a family and make a stand. The conclusion of the issue prompts its continuance in a series entitled Forever Evil: Rogues Rebellion. Thus stated, in the absence of heroes, as with the Gorilla War, the Rogues are stepping up to the plate and doing what they do best . . . spitting in the face of anyone who dares try to tell them what to do. Teen Titans #23.2: Deathstroke was another issue that only dealt topically with the subject and gave a cliffsnotes version rather than a cohesive story. The plot jumped around like a dog with fleas. First it’s at one point in Deathstroke’s life, then on the next page it jumps to a few minutes later, fine. But then it jumps back twenty years, then to an unrelated point in his life ten years later, then ten years later than that, then the present, then the birth of his son, then he’s home with his daughter. Trying to keep up makes the reader wish for a Dramamine. It’s clear that writers Dooma Wendschuh and Corey May are new to the comic writing gig. I know that they are responsible for the writing of the video games “Assassins Creed” and “Batman: Arkham Origins,” but I think writing single issue comics is something they need time to acclimate to. They don’t have a ten hour game to exposes a plot over. Moritat’s artwork is amazing, however, and truly makes the issue worth at least looking at. Justice League of America #7.3: Shadow-Thief adds another new face to the New DCU. Although Shadow Thief isn’t a new villain, the woman portraying it is. The Shadow Thief was originally a man named Carl Sands who got his powers from a device called the dimensiometer and used his abilities for crime. This time around Shadow Thief is an Israeli intelligence operative named Aviva. Right off the bat she foreshadows (pun intended) that working in her occupation can cause you to lose your soul. Like General Zod last week, the Frederick Nietzche quote, “battle not with monsters lest ye become one,” is very apt. Her past paints her as paranoid, reactionary, and already a monster before she donned the black shadow skin that gives her the powers inherent to it. As a Mossad agent she killed her superior officer to unilaterally launch a missile strike that did neutralize enemy combatants . . . along with killing hundreds of innocent civilians. She didn’t shed any tears. This led her to flee Israel and get work with A.R.G.U.S in the United States until she came into contact with a Daemonite who inadvertently put her in a position that cost her the lives of her mother and younger brother. From there she also accidentally donned the shadow skin and discovered she could control shadows, travel through shadows across the globe, and become insubstantial like a living shadow. With this she wages a war against aliens. But she also realizes she is becoming more like the aliens she fights and the skin, which she has to rip off when she is done with it every time, is becoming harder and harder to separate. One day it won’t come off at all. But she doesn’t stop, because she can’t. She’s already lost everything that could save her. Now she is adrift in a sea of all her worst traits. Time will tell what the Void will do to her. Wonder Woman #23.1: Cheetah is another comic that I just could not get into. It just grated me in the wrong way and I feel like it brought out the worst instincts in me as a person. Perhaps that was what writer John Ostrander was going for when he wrote this, as the Cheetah is the worst, animalistic instincts that come from the bowls of the character, Barbara Minerva. I also feel like it is an examination of the different conceptualizations people have of feminism. Wonder Woman is perhaps the greatest feminist icon in the comic medium and a paragon of strong women that extends outside of comics as well. It is something that has haunted the character almost from her inception, putting her on a pedestal of scrutiny that many female characters in comics, television, film, and other forms of literature rarely are subject to. She has to be perfect and has to be a role model for girls, but what exactly should she embody and convey to the women who read her? That’s the question with no answer. It also is a major reason that apart from the Linda Carter TV show, there has never been a live action adaptation of the Amazing Amazon. However, focusing back on the character herself the general assumption is that Wonder Woman is a “real” woman who embodies strength, wisdom, honor, and integrity of a female warrior race. 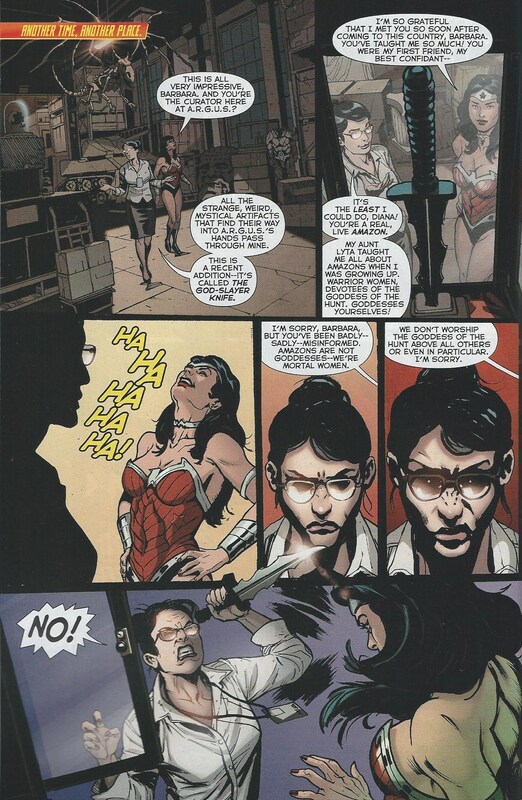 Cheetah in this comic began her association with Wonder Woman as her friend and confidante. She was a professor of antiquities, Dr. Barbara Minerva, who helped curate magical artifacts for A.R.G.U.S. Since Wonder Woman was brought into governmental affairs by Col. Steve Trevor, she also was involved in the arcane aspects of A.R.G.U.S’s collecting. Ostrander posits that Minerva was raised by her Aunt Lyta in worship of the goddess of the hunt as the Amazons did before them and that the Amazons were goddesses themselves. Wonder Woman laughs at this, because from her perspective, the thought is ridiculous. Amazons (who could be viewed symbolically as empowered women) were not and are not goddesses or any better inherently than anyone else. They are equal to men or women found in the world of men. This results in an immediate reaction of unbridled anger at the deeply fostered beliefs in Amazonian divinity embedded in Barbara’s psyche. That process of indoctrination and being raised in what could be described as a Hellenistic cult is truly horrifying, considering that she was made to hunt her own brother while her mother was forced to watch by Lyta, all to prove a point about the strength of women descended from Amazons. However, years later after turning into the Cheetah and literally becoming an acolyte who kills in honor of the goddess of the hunt, she realizes the futility of her insane aunt’s proselytizing. Wonder Woman was right about Amazons, she was right about worshiping the hunt and violence as a solution, but she accepts that this path has led her into being a monster that consumes that which feeds it, namely returning to where it all began and hunting her Aunt and giving the “glory” of the insane woman’s death to the goddess which that same priestess worshiped above all others. What separates a noble warrior like Wonder Woman from a cold blooded killer like Cheetah and her aunt is compassion, wisdom, and understanding, always trying to understand those that oppose you and treat with them before resorting to hostility. When Geoff Johns first wrote Wonder Woman I did not like her at all, because she did not embody these key principles. I feel that since then it has been made clear that what we see here is the Wonder Woman that needs to be depicted and that these traits are what makes her not only a strong woman, but just a very strong character in general. If you take those characteristics away from her, as DC creators (looking at you Johns) tried to in the beginning, you turn her into a ravenous beast like Cheetah. Arrow #11 marches closer and closer to completing the storytelling omitted from the first season of the television series. Inside is the story of a low level enforcer for the mob doing horrible things to scratch out a living for him and his family. Following this is perhaps the most anticipated side story of the season. Laying in a hospital bed, Malcolm Merlyn recounts the journey that led him to become the Black Archer. While it’s very short, only ten pages, there is a a great deal of revelation in those ten pages, including the desired vengeance for what happened to Malcolm’s wife that led him down the road to his “Undertaking.” The issue ends with a look at a formative episode in Roy Harper’s life before the start of the show. Roy maintains that he can be more than what he is and after his abduction in the episode “Salvation” he tries actively to fulfill that potential. In his segment in this issue we see him given a chance and blowing it completely, but despite that he learns that even the people he wrongs still have faith in him. It also explains how he got his distinctive red hoodie. If you love the show Arrow this comic is definitely a worthwhile bookend that fleshes out the plots even further. There were some really incredible stories told this week, and quite a few that failed to measure up. What didn’t quite pan out was more than made up for in the comics that exceeded expectations and fulfilled their subjects’ potential. After this there is only one more week in September’s Villains Month. I can’t wait to read the final batch of issues and share my thoughts. Hope to see you then. Action Comics #23.3: Lex Luthor: Drawn by Raymund Bermudez, Colored by Ulises Arreola, Inked by Dan Green. 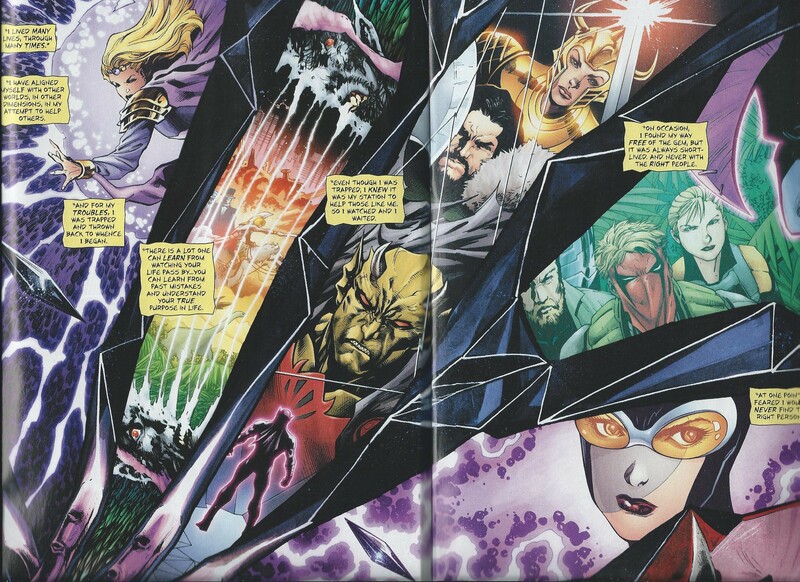 Justice League Dark #23.2: Eclipso: Drawn by Philip Tan, Colored by Nathan Eyring, Inked by Jason Paz. This entry was posted in Weekly Reviews and tagged Action Comics, Alberto Ponticelli, Annie Wu, Arcane, Batman, Batman & Robin, Black Hand, Brendan McCarthy, Carla Barrocal, Carmen Carnero, Charles Soule, China Mieville, Dan Didio, Dan Green, Dan Jurgens, David Lapham, Dial E, Eclipso, Emi Lennox, Emma Rios, Frazer Irving, Green Lantern, H'el, James Tynion IV, Jeff Lemire, Jeremy Haun, Jesus Saiz, Jock, Justice League, Justice League Dark, Kelsey Wroten, League of Assassins, Lex Luthor, Liam Sharp, Marley Zarcone, Mateus Santolouco, Michelle Farran, Philip Tan, Ra's Al Ghul, Raymond Bermudez, Riccardo Burchielli, Scott Lobdell, Sloane Leong, Superman, Swamp Thing, Tina Lotay, Zak Smith.